Discussion in 'Ad Campaigns' started by Miss Dalloway, Jun 20, 2009. Not bad. I expected worse. wow...this looks alot like the runway show..hmmm. Not sure about this yet, beautiful but slightly boring. Can't wait to see the rest though. You can't see it but I'm crying tears of pain right now. Nothing exciting but better than last season. Kendra? that took me by surprise... are they on a raft? yea, what are they standing on? i dont think this campaign can top last seasons. prada campaigns always sell the clothing to me, hopefully this doesnt disappoint. so far its just blah.. I think its a little boat, they seem as if they might fall over board in the water. 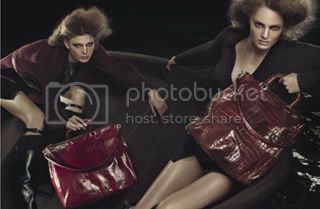 I need to see more, and although i like how they look i resent the blatant pushing of the handbags, its to in your face. I think its a horse carriage, because I know for a fact that the horse was involved. they are in water and as someone else said in the campaigns thread I think the horses were not a part of the final product. Why would it be deleted? The campaign is out on the net at more sites, not just the one credited! ^^I just seen it, that is very strange, it would be nice if we were informed about it. Thanks for the heads up. Though is does sound like a good concept I don't think it's a carriage, you can see water glistening in the bottom right. I actually quite like this, but Kendra and Ymre are so heavily photoshopped they almost don't look like themselves, which in a way is a good thing. Kendra is in that picture? i do not recognise her at all. ^I dunno, somebody said it was her, they all look the same to me. I'm not sure if I like it or not.